There are many situations in which a virus infection causes our data to disappear from where they were. The problem is, we realize that the data is still there (as indicated by space on our disk), but we cannot access the data. But this data can easily be recovered without any software. 1. Try to remove the infection by using an updated antivirus. If you’re using a Genuine Windows, go for Microsoft Security Essentials (free for Genuine users) or else you can try ESET or McAfee. 2. Open Start menu, click Control Panel, and then double-click on Folder Options. 3. Click on View Tab and select Show hidden files and folders. 4. 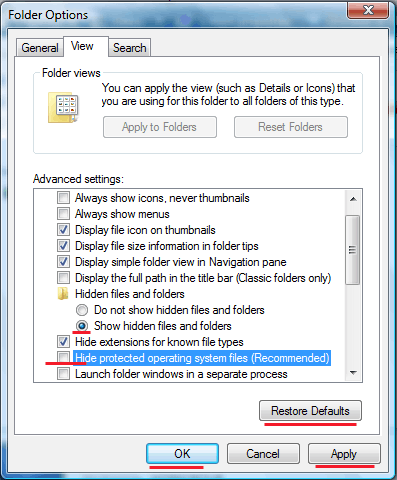 Uncheck “Hide protected operating system files (Recommended)“, one warning window will be popped up. Click yes to uncheck this option. 5. Apply settings and hit enter. 6. Now it should allow you to access all the vanished data like showed hidden files or folders. 7. Copy all the files into a new location. 8. Open Folder options>> View >>Restore Defaults. Now your previously disappeared files can be accessed anytime from the new location.